Truth be told, I don't love wearing pants. Or jeans. Or shorts. I wear them a ton especially in the winter because they keep my legs warm, but in all honesty - I prefer a skirt or dress. They let my legs breathe! 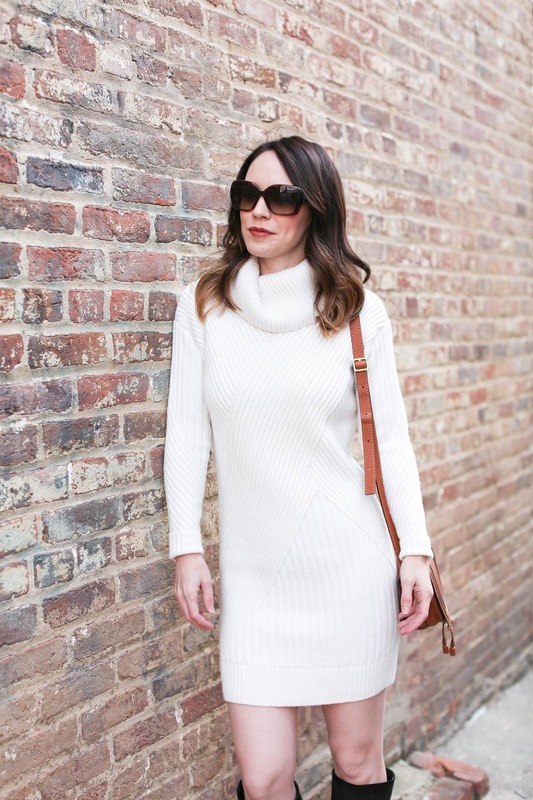 Sweater dresses are one of the most comfortable cold weather dress options and this one mixes so many of my favorite elements - a cowl neck, a neutral color and I find that a more fitted sweater dress helps to balance out the bulk of the heavier material. The criss cross pattern also makes it figure flattering and helps to define the waist. I wore this a few weeks ago when no coat or tights was necessary, pairing it with some of my favorite YSL boots that I purchased almost a decade ago! But I can easily seen this dressed down with sneakers and a vest, or snow boots, tights (these are my all-time favorite tights) and a parka. I checked the forecast and it is already going to be hitting the 20's next week so sadly a 'no tights and coat' option is no longer feasible. I have always wanted to take a trip somewhere warm in the dead of winter, so Stan and I just booked a trip to Palm Springs and LA for the first part of January! It's our first time to Palm Springs, though I have spent a little time in Palm Desert and loved it. We have both been to LA but not together so all we can think about is what restaurants we are going to hit up first. Ha! If you have any recommendations for either city, please let me know! Super gorgeous and simple look!! Love the details on the dress!